Curl up in one of the overstuffed chairs next to the fireplace, or belly up to the bar — the River Roost is the place to gather for an ice-cold beer, Southern-style specialty drinks and the best appetizers this side of Sassagoula. Sip a Hurricane, Sassagoula Sunset or Bayou Bloody Mary as you soak up the riverside romance, this is a great place to grab a nightcap after an exciting day exploring the parks. A large screen TV is available for sports events/etc. Opening Hours: 5pm — midnight (opens earlier when the pool bar is closed due to inclement weather). Note: Over Christmas 2016, the bar hours were extended to a 1am closing time, however this was at the bartender’s discretion depending on trade. Playing at the River Roost Lounge on Wednesday through Saturday evenings from 8:30pm until a little before midnight is the famed “Ye Haa” Bob Jackson (who you can follow on Facebook). 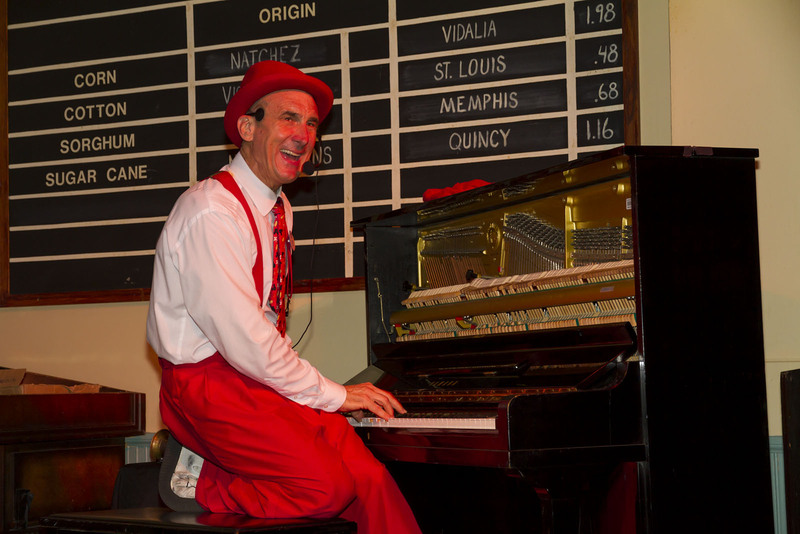 Bob performs a very popular piano sing-along comedy show with lots of audience participation for all the family to enjoy. I’d suggest getting there a bit early to grab the best seats — Bob will usually be hanging around before the show getting to know the evening’s audience, so do let him know if you’re celebrating something, on your honeymoon, or just want to request a song. Note: the entertainment can be quite loud and boisterous, so if you’re looking for a more relaxing or intimate quiet drink then you might prefer to visit the lounge on a Sunday, Monday or Tuesday instead. Surprisingly when Bob first started playing at what was then referred to as the Cotton Co-Op on 4th May 1997, the location was not especially well-known as a nighttime entertainment venue, filled mainly with weary tourists relaxing after a long day at the parks, or guests waiting for their reservations at the nearby Boatwright's Dining Hall. However Bob saw the potential to turn the lounge into a lively destination attraction, and his dueling piano background, which necessitated getting people up on their feet and singing along, gave him the experience needed to bring the same vibe and energy to his new home. Two decades later, and now an official Walt Disney Legacy Award recipient, “Ye Haa” Bob is still wowing the crowds with his zany mixture of toe-tapping, sing-a-long standards, and increasingly frequent Disney classics performed in his own inimitable and enormously energetic style. His shows attract a multi-generational crowd from babes-in-arms to octogenarians, all of whom are encouraged to join in the fun, and his amazing memory comes to the fore as he interacts with his audience members by name. Away from the Port, Bob is a talented musician and composer in his own right. He began playing piano from a very early age, and was a music composition major at the Cincinnati Conservatory of Music. He has also worked at many other locations around Orlando (such as Rosie O'Grady's at the new-defunct Church Street Station, SeaWorld, and Universal's CityWalk) and around Walt Disney World (including the Diamond Horseshoe Revue in the Magic Kingdom). Bob has recorded at least ten CDs (available from www.yehaabob.com) including collections of his own original material. He also regularly performs at local churches and for children with life-threatening illnesses and their families at the wish-fulfilling "Give Kids the World" village. As Bob so often says at his shows, "no one has more fun than us," and given that he can count the likes of Disney/Pixar's Chief Creative Officer John Lasseter among his many fans, he's probably right! As part of the 2008 Mousefest event, the Disney Podcast Network held a Bob Jackson Meet at Port Orleans Riverside’s River Roost Lounge on Thursday 11 December 2008 at 8pm. It wasn’t a formal event, anyone was welcome to turn up and meet fellow Disney fans for a friendly nightcap. A few pictures from the meet are here on flickr. Bob Jackson featured as a guest on the 23rd February 2010 edition of the Main Street Mugs Live podcast. The full show can be heard on their website or you can downloaded it as an MP3 file. More recently, the WDW Radio Show episode 360 featured a live interview with Bob, which can also be downloaded as an MP3 file. 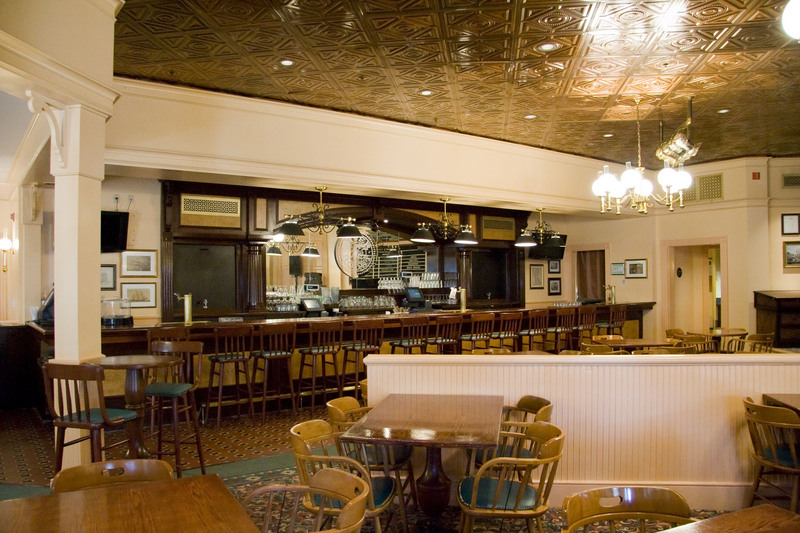 Note: There were some plans to make the whole of the Boatwright’s restaurant menu available from the River Roost Lounge too in early 2017, but nothing has come of this so far. A limited-menu continental breakfast was recently made available at the River Roost Lounge featuring pastries, coffee, etc. Very convenient for a quick pre-park snack with no lines. However this service was withdrawn after 26 Aug 2015, partly due to difficulties in promoting the service and enticing guests over from the Riverside Mill, and there is no current indication of whether it will return.